Airlines growing their own food? It’s a thing. Korean Air recently invited me to visit the company’s ranch in South Korea where they farm livestock, chicken, veggies, fruit and bottle their own water to serve to passengers. Other airlines have farming projects underway as well. I have story – with lots of photos- from my farm visit on USA TODAY’s Today in the Sky. Here are some highlights of the story. Back in 1972, when beef was in short supply in South Korea, the then chairman of Korea Air’s parent group bought a 3,700 acre ranch on South Korea’s Jeju Island. Imported Angus cattle got things started, but now the herd is about 2,200 Korean native cattle known as Hanwoo. Meat from these animals, and from the farm’s flock of approximately 6000 free-range chickens, is sent to Korean Air’s flight catering kitchens in Seoul for use in meals served to first and business-class passengers. In addition to raising cows and chickens, the ranch also produces fruit, vegetables – and bottled water – for Korean Air passengers. The water bottling plant at the ranch has been operating for 35 years and there they make and fill cups and bottles of the airline’s branded ‘Hanjin Jeju Pure Water.’ The water is pumped from 1,070 feet underground and filtered through layers of the island’s volcanic rock. In 2015 JetBlue debuted a large milk-crate garden outside Terminal 5 at New York’s John F Kennedy International Airport. Potatoes, vegetables and herbs grown there are donated to local food banks. Japan Air Lines is creating a ‘you-pick’ agritourism attraction on land near Tokyo’s Narita International Airport that is scheduled to open in 2020. The carrier hopes to add food grown on that farm to in-flight and lounge menus. And Emirates is having the world’s largest vertical farming facility built near the Dubai airport. At full production, the daily harvest from the the 130,000-square foot facility should be about three tons of pesticide-free leafy greens that will be used in many of the meals Emirates Flight Catering prepares for 105 airlines and 25 airport lounges. With shower-equipped private suites on its A380 airplanes and Bulgari amenity kits and moisturizing pajamas for first class passengers on long-haul overnight flights, Dubai-based Emirates works hard to maintain a high-class image. And they aren’t resting on their laurels. As part of the airline’s recent ‘comforter overhaul,’ passengers flying long-haul in the First Class cabin sleep under faux sheep-skin blankets. Those flying Business Class get soft duvets. And now economy class passengers on long haul flights – who already receive amenity kits filled with useful items such as an eye mask, earplugs, toothbrush, toothpaste and socks – are able to snuggle up beneath environmentally-friendly blankets made entirely from recycled plastic bottles. Each blanket is made from the equivalent of 28 recycled bottles that have made using the ecoTHREAD patented technology that first turns the bottles into plastic chips, then into yarn, and then into threads of polar fleece material that can be woven into soft blankets. “I found them to be softer and warmer than the standard blankets most airlines provide,” said Carol Pucci, a travel writer who documented her recent Emirates flight from Seattle to Dubai in the economy cabin. Like many other airlines, Emirates has sustainability program that includes collecting and recycling aluminum cans, plastic and glass bottles and paper, including magazine and newspapers, used on board. The ecoThread blankets come to Emirates via Buzz, a company specializing in inflight products. 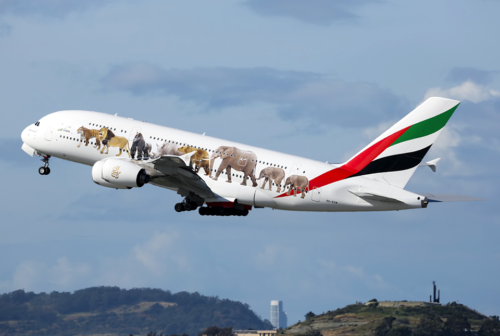 By adopting the ecoThread blankets for economy class, Emirates says it will reduce energy emissions and, after three years, will have diverted 88 million plastic bottles from landfills – the equivalent weight, the carrier notes, of 44 A380 aircraft. And while Emirates now claims to have the largest sustainable blanket program in the airline industry, it is not to the first airline to carry the ecoThread blankets onboard. That honor goes to Australian low-fare carrier Jetstar, which began using the blankets in 2015. On Monday, I was pleased to be on board when Qantas began flying the world’s largest airplane – the Airbus A380 – on the world’s longest nautical route – from Sydney to Dallas/Fort Worth. On Wednesday, DFW International Airport celebrated the arrival of another A380: this one belonging to Emirates and arriving from Dubai. As part of the celebration on the ground, not cupcakes, but cake.